The first British Invasion ... and more! Frenchman, Henri Sitek (Ouest Team) hands over a paper lantern to a smiling Tony Hoar. 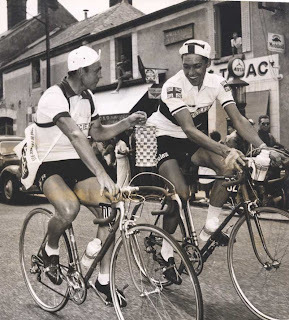 Hoar will become the first Briton to 'win' the Lantern Rouge at the 1955 Tour! I'm fascinated by the last place finisher of the big stage races. My admiration is directed towards their tenacity and courage to stay involved right to the end. 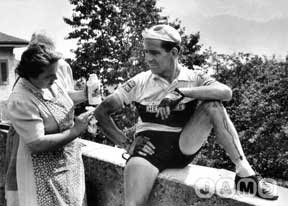 Louison Bobet was the first rider to go into the history books to win the Tour three times in a row. This was a time of; national teams, wool collar jerseys and scratchy wool shorts, water bottles on handlebars, and riders carrying tires wrapped around their backs. Simpler times. Tony Hoar was a relative unknown. He rode only 1 pro season, in 1955-56 for the Swiss base Cilo-Saint-Raphael Team. 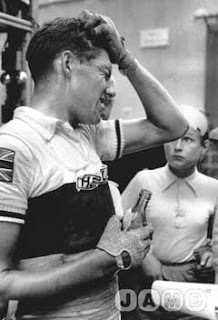 After the three weeks of punishment he would fight on to take the lanterne Rouge as last man. The first Briton to do so. Afterwards, Hoar was very popular on the post-tour criterium circuit. British bike manufacturer, Hercules put together the British team for this Tour. Most notably was Brian Robinson, also riding his first Tour he finished a fantastic 29th. Hoar and Robinson were the first Britons to finish the Tour. And, Robinson was a rider destined for success as his high placings show before that Tour: Paris-Nice (8th) and La Fleche Wallonne (4th). And talented he was, Robinson would go on to win two Tour stages in 1958 & 1959. To cap it all off, overall win in the 1961 Critérium du Dauphiné Libéré. With his accomplishments, Robinson opened the door for other english speaking riders like Tom Simpson and Barry Hoban to enter into the European cycling world. This was the start of the British invasion! 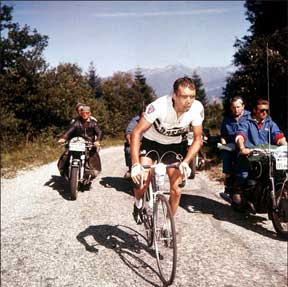 Talented Brian Robinson at the 1961 Dauphine. He'll win the tough 8 day race! Tony Hoar feeling the effects of the hard racing. He would fight on to 'win' in 69th place, 6 hours behind Bobet. Unlucky Bob Maitland is tended to after a crash. He abandoned on stage 9.